Fancy cooking but have no ideas? At all? Spent years cooking the same old thing because you’re busy or simply too tired to think? You’ve stumbled across the right page. In this section we’re collecting tried and tested recipes to share. Do you have any recipes which have helped you get out of your rut and transported your cooking to the dizzy heights of culinary nirvana? To start us off read how Sarah got out of her cooking doldrums and jumped at her friend’s suggestion that she accept the New Year’s Recipe Challenge and cook at least one new recipe every fortnight. “You’re on!” And I start planning my first new recipe. Five months later, I’m proud to say that I’m still going strong. January was spicy with Cajun alligator with sweet potato and salsa from Jamie’s America. My supermarket was out of alligator (and I didn’t even ask my Parisian butcher!) and so I used chicken breasts, and my dinner party guests were still quite impressed! January continued with Jamie with Tomato soup from 30-Minute Meals. You roast cherry tomatoes, chilies, and garlic together, and then blend them with onions cooked in balsamic and fresh basil. Just perfect for a quick Saturday lunch after my swim! February started with Beef stroganoff from Delia Smith’s Complete Cookery Course. I made it for a romantic dinner for two, with basmati rice and fresh green salad. I’m proud to say it got the seal of approval from a Frenchman, no mean feat! 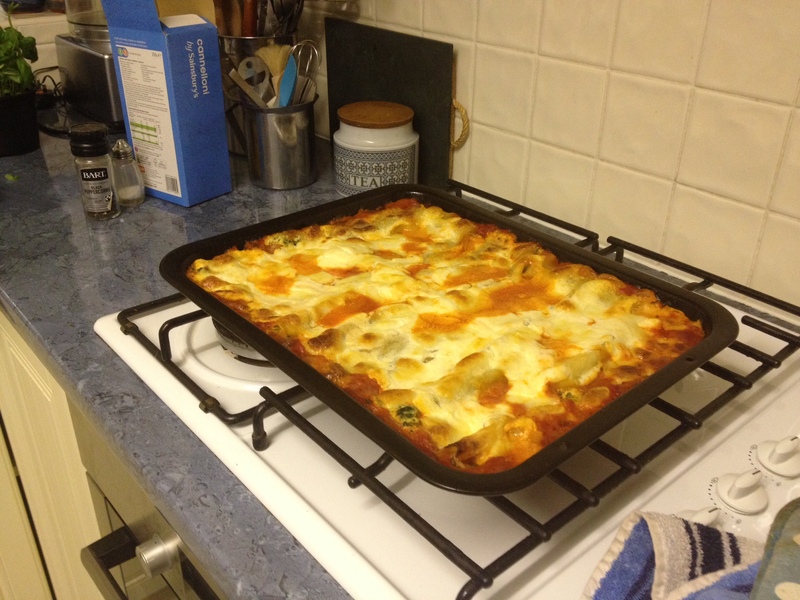 But it was nothing compared with the next recipe, Jamie Oliver’s Awesome spinach and ricotta cannelloni, which I made for my parents while on holiday in England late February. 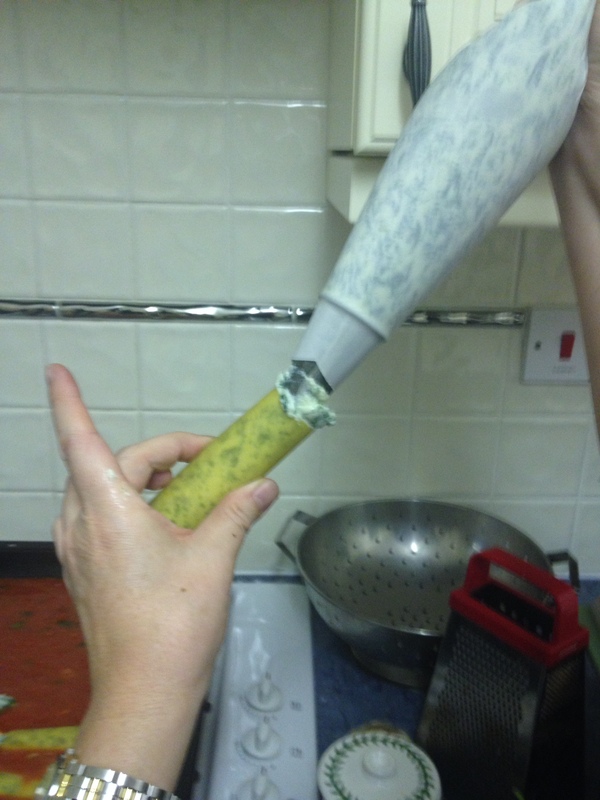 The biggest challenge was piping the spinach and ricotta mixture into the cannelloni. The result was, predictably, awesome! The first recipe March was Chicken and leek pie, from Nigel Slater. It might seem a little run of the mill for England, but the whole pie concept is so very exotic for France. I served it with a Jardinière de légumes (carrots and peas cooked in stock, another new recipe!). The kids loved it: 9 out of 10! Nigel Slater contributed the second March recipe too, cut out of the Sunday paper when I was in the UK. Thai chicken curry, with homemade red chilli paste, coconut milk, and griddled chicken strips. Delicious! 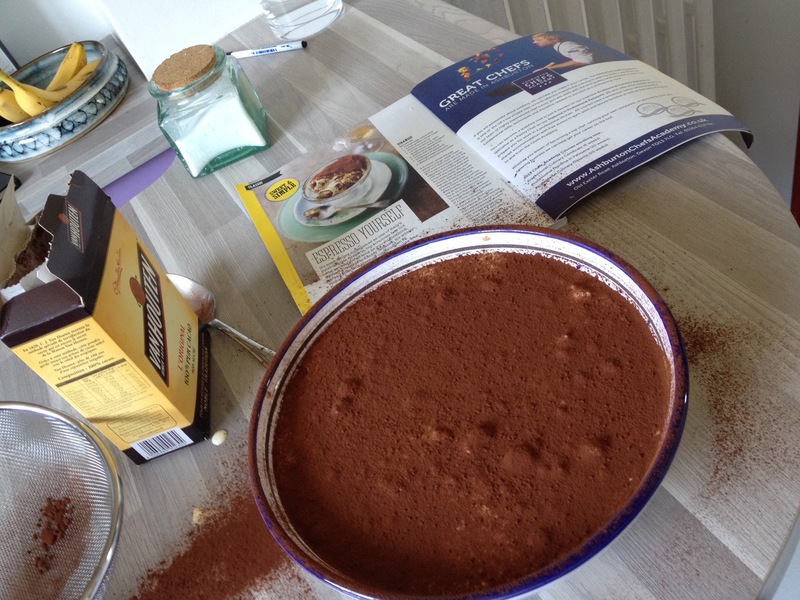 Unbelievable, perhaps, but I never made a Tiramisu before April! I used a Jamie Oliver recipe from an English magazine. I had to replace sponge finger biscuits with biscuits à la cuillière, and half way through realized that someone had finished my amaretto and had to replace that with whisky. The result was excellent, and I got a 10! Later in April, I bought a breadmaker and started making my own bread. 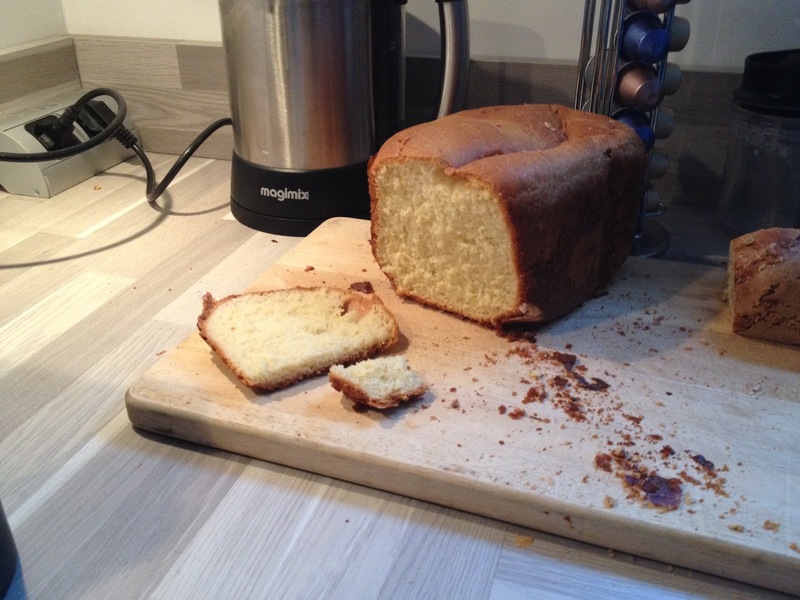 The next new recipe came from the Moulinex booklet: French brioche. The dough combines yeast, flour, eggs, butter, and milk, and smells divine as it cooks. The brioche was just perfect and well worth the 3 hours’ wait! The major challenge here was persuading the kids to leave some for breakfast the next day! So far, so good! I’m enjoying my New Year’s Resolution! It’s lovely to try new techniques and new flavours. I’m now searching for May’s recipes. You can send suggestions (and encouragements!) 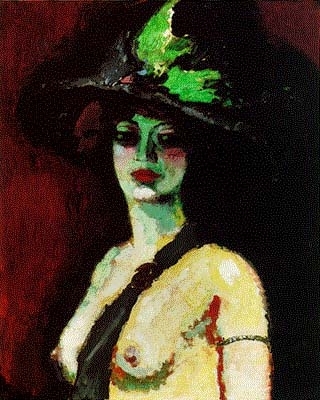 to FrockFriday. Just avoid the double cream! Here’s a link to some of those recipes. A new recipe a fortnight sounds about right. You can imagine actually keeping up with that…. or perhaps once a month. I’m SO excited about this! I’ve been serving up food for French students for some time now and I’m running out of recipes with which to impress them ( and believe me, they’re hard to impress).